Tyler and Evelyn Murray, Jimmy and Jean Murray, Sandy and Lottie Murray and respective offspring. Hi, could you tell me if Jean Murray's maiden name was Duncan?. I am tracing my family history, and I think my gt gt aunt was Jean Thompson Duncan who married James Murray. Marshmyres is an address that has cropped up in talking with relatives. If this is the same Jean, then her mothers maiden name was Pickard. My father Albert Pickard was raised in Alford, and the names that I know of are the Lingard and Gilbert family. Can anyone help me? My dad was left orphaned in 1923 and I think he may have been fostered or cared for around that time by one of the families. Any info would be great. Jean,s maiden name was Duncan.I believe her brother Davy wrote a book which told of her childhood in Aberdeen and move to Marchmyres. Jean died on 26th dec 1979. Thank you Alistair for your reply. I don't suppose you know the name of the book? I have tried googling it but nothing came up.I'm sure this is the same Jean that my father knew. Great photo of my Grandad Jimmy & Grandma Jean Murray. Are the two boys with Jimmy his own? My dad was born in 1930 and he was the oldest son. Could Jimmy be holding Jim and Stewart? Is Jean holding Allan or my dad? 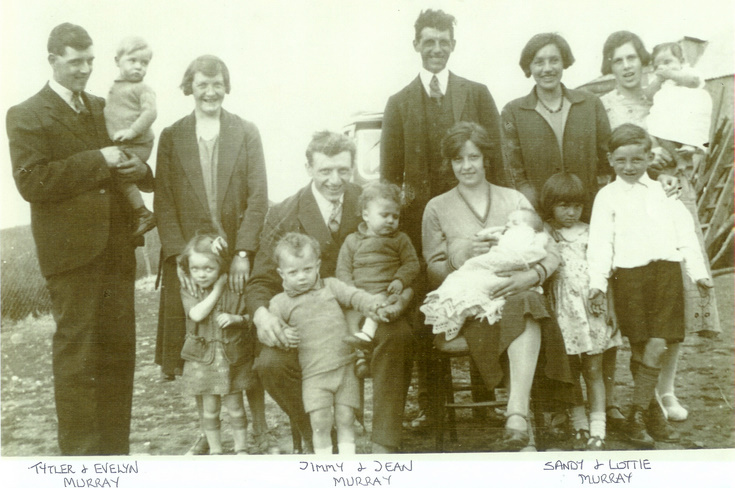 Picture taken at Parkhead,Tullynessle,(see Thomson photographs) home of John Tytler Murray and Agnes Murray circa 1933 possibly grandson Edwin's christening.In the picture are only some of their family.Starting on the left are John Tytler Murray II with John Tytler Murray III in his arms and his wife Eveline Constance Murray (nee McRobbie)with Eveline Constance Murray II at her feet,(My Mummy).Note the correct spellings.Seated is James Thom Murray with Stewartie on his knee and Jimmy in front,next to him sits his wife Jean (nee Duncan)with baby Edwin(Eddie).On the right hand side at the back stands Alexander (Sandy) with his wife Charlotte (Lottie)(nee Coutts),next to her is Elizabeth Thom Barbour(Betty)(nee Murray) carrying her daughter Sheila.The two children in front of Charlotte and Elizabeth are Molly Murray and Alexander Murray Jnr. Not in the picture are Mary Agnes Murray(Molly Wilson),Stewart,Jean Murray(Creasey), Martha Murray(Matty Smith) or Douglas.Hope this fills out some blanks.Happy New Year for 2011. Hi Diane, I hope you don't mind me asking, but have you any info on your Gran's family? My dad was brought up with her in Alford, after leaving Aberdeen.She would have been his aunt. This is all new to me and I would love to know more about Jean and her parents. I could send you my e-mail address if you like. Thanks Anne.